EkPrayas school continues to be one of our the IWiN partner in India, houses about 200 children from slums, aged 4-14yrs. The School provides both academic and vocational training in English medium through a systematic curriculum, appropriate to students' specific needs. 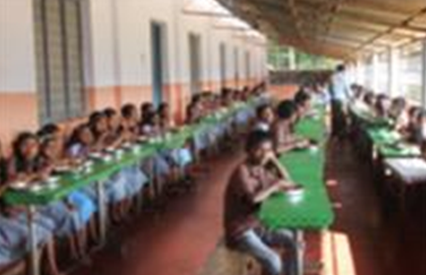 Breakfast and lunch are provided to the children in school daily, in addition to their school uniforms, textbooks and stationaries - mostly sponsored by generous donors. IWiN is supporting this school in setting up of a Computer Training Centre for the students, starting in the 2014-15 academic year. Wayanad has the highest population of tribal people in Kerala. The tribal people have had no access to education any time in their lives. Today tribal people are exploited as the work force for cash crop estate works like coffee and vanilla, and other illegal activities. Dr. Appanu Nambiar, a retired professor of education, founded this school in 1997 with an objective of providing a safe environment to educate the tribal children to adapt to modern day challenges and still retain their age-old cultural customs. The school that started with 41 students has more than 250 students now. Another significant change that happened is about the caste system mindsetwhich exists among the tribal people. During the initial days of the school, the divisions based on the caste were very evident among students. Students of the 'so called' upper caste did not interact or eat with the rest of the students, reflecting their family customs. Significant progress has been made in this aspect.